When the New 52 revamped the DC comics universe in 2011, one sticking point with fans was some of the new looks for the companies most popular characters, especially the overdesigned suits. 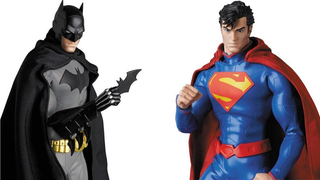 But Medicom might have actually made Batman and Superman look pretty great with these new figures! Medicom's 12-inch Real Action Heroes line has been home to plenty of great figures over the years, but these two new DC toys might be some of their best yet. Eschewing realism for more comic-booky looks - Supes especially looks spot on as a recreation of his comic book likeness - but to me the best parts are the detailing in the outfits themselves. The capes are a little too loose/thick (although that is to hold a wire armature so you can pose them), but the actual suits look really nice. They've got the sheen and look of superhero spandex that most toymakers tend to avoid by turning them into cloth, but at the same time they also tone down the lines etched into them so they're less obviously apparent as they were on the pages of Comic books, but still add a nice bit of texturing to the overall look. I was never a big fan of the New 52 look when it launched, but they look really nice here. Maybe they were always destined to be great action figure designs instead of great comic book ones. Clark and Bruce are due for release in August of next year, for $210 apiece. At least you have plenty of time to save up for them!